Macy’s is a great company that wants to reward you for purchasing items. Their credit cards give you rewards for shopping and will allow you to be a part of their royalty system. There are many benefits. When you use your Macy’s credit card you save 25% off coupons and saving events. Macy’s has been around for as long as anyone can remember. Everyone loves Macy’s from shopping there to even the annual Macy’s Day Thanksgiving Parade that excites millions around the world. 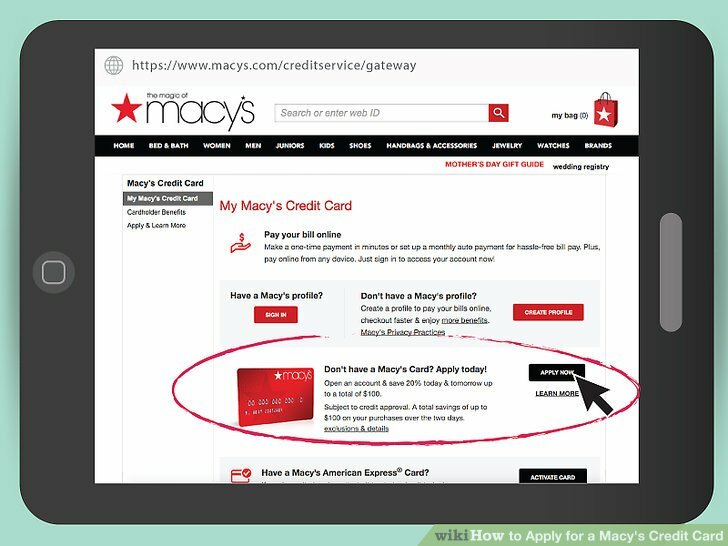 For frequent Macy’s shoppers, the Macy’s credit card might want to be something that you look into. By using their card, Macy’s gives shoppers various rewards when purchasing. Some of the frequently asked questions concerning this card are will this card help improve my credit scores, is there a military discount, and how often does this card report to the credit bureaus? The answers to all of these questions are going to be discussed throughout this article, and this information comes from the most recent updated information of the Macy’s credit card. It is a fairly simple process to apply for a Macy’s credit card. 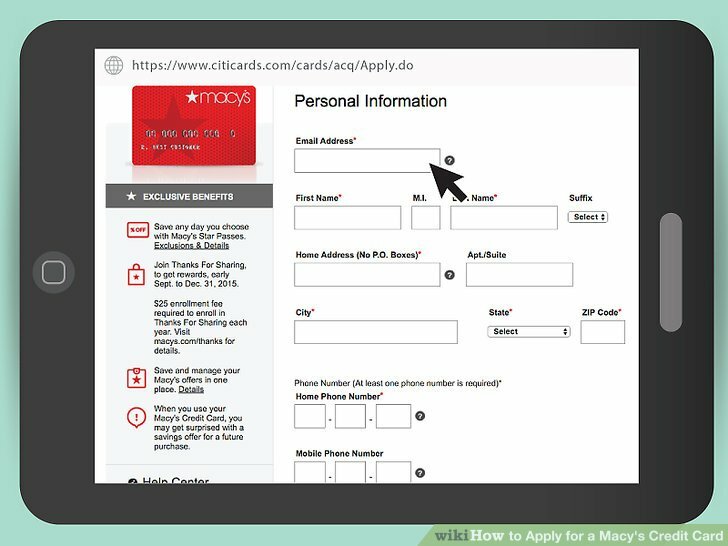 The two options to go about applying it to either go to the Macy’s online website or to go to the department store and fill out the application by hand. If you are looking for the application online, once you get to the Macy’s web page, you look for the “search” box at the top of the page. In the search box, you are going to type in “Macy’s Credit Card” and hit enter. The next thing that should pop up is a list of options, (you will also find updated information of the Macy’s credit card), including an “apply now” button, click that button. After clicking the “apply now” button, a screen is going to pop up, which requires the applicant to fill in a bunch of different information. Initially, Macy’s asks for your name, (your full name like what would be on your tax return), email address, billing address including city, state, and zip, and a valid cell phone number. The next thing that the applicant will have to fill in is some general financial information. The reasoning for this is for Macy’s to make sure that whoever is applying is a good candidate to receive their card. This information includes a person’s annual income, whether they own or rent a home, and the mortgage or rent for their home. You will also have enter in your birthday, social security number, and a valid driver’s license number. This information is very sensitive, so precautions definitely need to be taken when releasing this kind of information. Attached to the application needs to be a copy of a valid photo ID, and this can be anything from a passport to a driver’s license. After you have entered in all of this information, you can scroll down to the “terms & conditions’ checkbox, which by clicking says that you agree with their terms. After that, you will be taken to another page where you can verify all of the information you put in previously to make sure everything is correct before submitting your application. After the review, just click the “submit application” button at the bottom right-hand corner of the page, and just like that, you are on your way to becoming an official Macy’s credit cardholder. If you are applying at a store location, one of the members of the service team at the customer service desk could get you a paper application, in which you would fill out all of the above information by hand. In addition, you can apply for the American Express version of the Macy’s credit card while you are in the store. The main advantage of having the American Express version of this card is because cardholders would be able to use the card in any other location, not just at the Macy’s store. This card also offers some pretty good rewards percentages. A shopper can receive 1-3% in rewards off purchase depending on how much they spend at Macy’s at any given time. This card is really beneficial for people who shop at Macy’s on a regular basis. All of this information is required to fight against terrorism and money laundering activities. They may also require you to show your driver’s license as well as other government documentation to be accepted. There is a Macy’s card and a Macy’s credit card supported by American Express. Both of them have late fees that have $38 added to your purchases. For both credit cards, you have a minimum interest charge of $2. For the normal card, you have a 26.24% APR and that varies on the market rate. On the American Express version, it is consistent. Both cards will not charge you interest until 25 days after your billing cycle. If you pay the bill before the due day you will not be charged interest. The American Express card charges interest when you make an advance on the cash transaction date. The Federal Protection Bureau will give you tips on finance. Macy’s will calculate your balance based on their “Daily balance (including current transactions)” method. For New York residents you may contact New York State Department of Financial Services for free information on credit cards, fees and grace periods. If you live in a foreign country, 1% of the money is paid to American Express as a foreign exchange fee. Since you will be making this account after October 3, 2017, you will be protected under the “Protections for Active Duty Service Members and their Dependents” rule in terms of service. There are some additional requirements. One must be at least 18 years of age to be considered for a card and 21 in Puerto Rico. People who are married can apply separately. Macy’s requires information based on your financial history. They may talk to your employer and gather reports to determine your eligibility. If you ask them, they will tell you whether you requested a credit bureau report. By giving them your email address and phone number, they will notify you of products and thing to look out for. On mobile devices, the website requires that agree to their terms of service as well as agree to disclose certain information. This will also have you submit your email address. The site will have you store or print web pages that have a minimum requirement of 128 bits. If you request a paper copy, it will be mailed to you free of charge. The laws against discrimination that Ohio has requires that everyone has an equal chance to get a card. The Ohio Civil Rights Commission frequently makes sure that this law is being followed. In Wisconsin, you must provide certain details of your marital status before your account can open. You will have to provide your spouse’s name and address to 1-800-243-6552 for legal reasons. The improvement of your credit score is dependent upon how responsible you are with the card as well. If you are making your payments on time and not maxing the card out, your credit score should reflect positive results. If you are wondering about how often does this card report to the credit bureaus then you should not need to worry. Macy’s is typically reliable when it comes to reporting to the credit bureaus frequently. Is there a military discount? Yes! Every first Tuesday of the month, Macy’s offers an extra 15% off for military personnel, active or retired, on purchases made during that day. If someone is seriously considering obtaining the American Express version of the Macy’s credit card, then they need to know that you can only apply for the card in a store, and you would have had to have a Macy’s credit card already. 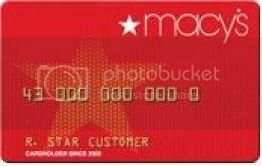 If there any other questions about the Macy’s credit card, or its other version, do not hesitate to call your local Macy’s store. This is really all of the updated information of the Macy’s Credit Card. This card seems to be a great option for people who can’t seem to live without Macy’s in their life. Will this card help improve my credit scores? Yes, if used responsibly. Is there a military discount? Yes, 15% off on purchases every first Tuesday of the month. How often does this card report to the credit bureaus? Typically, Macy’s reports to the credit bureaus on the first of every month. All in all, Macy’s is definitely a name you can trust.